Natl. Cact. Succ. J. vi. 8 (1951). Type locality: Serranía de San Miscrato, Chiquitos province, Bolivia. Altitude: The altitude varies between 150-900 metres above sea level. Habitat: It is found on inselbergs in the ecotonal region between the Bolivian part of the 'cerrado' and Amazonian forests with high average temperatures for most of the year. It grows on flat rocks only in shady, forested areas where soil retains moisture during short droughts and the rainfall is in excess of 1000 mm per annum, but given the very rocky substrate, the water should drain away quickly. The soil is fine sandy-loamy or fine grained and permeable, but too shallow for a lot of plants that otherwise would shade out the tiny frailea. Frailea chiquitana grow isolated or in dense colonies in all sizes and grow together with Frailea pullispina and Echinopsis hammerschmdii. 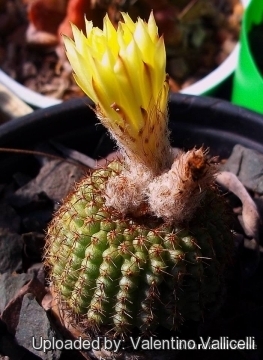 Frailea chiquitana f. cristata hort. 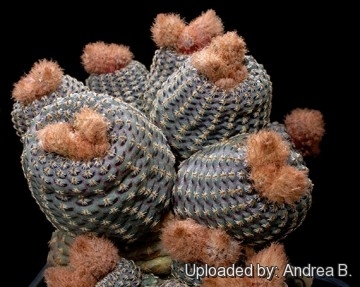 Description: Frailea chiquitana is a dwarf cactus with unique and remarkably beautiful shape. 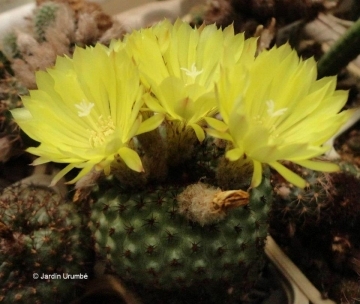 Contrary to most representatives of the genus Frailea, this species show no cleistogamous flowers. Habit: It is a s small depressed perennial stem succulent, usually solitary, rarely offsetting or many-stemmed forming low, flat clusters that grow deeply seated flat to the ground surface. Only in cultivation plants may have a spherical till columnar shape. Roots: Conical, tuberous, with fine lateral diffuse roots. Stems: Depressed-spherical to spherical, rarely short-cylindricand more or less imbilicate at apex. Individual stems 2,5-3,5(-4) cm in diameter, 2-3 cm tall (or more in cultivation) yellowish or bluish green or tinged with purplish and with a dark purple-brown lunate, blots situated below the areoles. Ribs: Numerous, (14-)18-24(-31), very small size (16 mm from rib tip to rib tip) straight, low, but well-defined that, despite its almost spherical shape gives it a high Surface/Volume ratio, and broken up into conspicuous, blunt tubercles 2-3 mm in diameter, often with pronounced reddish markings beneath. Areoles: Large elliptical, prominent, white to dark brown often with persistent white wool. Spines: Not or slightly interlaced. to 3 mm, whitish or more often dark brown to blackish. Central spines: Absent, occasionally 1 to 3 dark brown, up to 3 mm long. Radial spines: (4-)5-8(-12) pectinate, bristle-like, whitish, adpressed up to 3 mm long. Flowers: Apical, diurnal, radial, funnelform to bell shaped, light to sulphur yellow from the top of the plant, 1,7-2(-3,2) mm long 2,2-2,5(-4) cm wide. Buds with light brown wool. Tepals attenuate-acute. Stigma-lobes 5-7, to 5,5 mm very slender. Fruit: Dry indehiscent with scales and bristles that detach easily up to 10 mm in diameter, pericarp membranous, fragile that break easily releasing the seed. Seeds: 2 mm in diameter, shiny dark brown to blackish. smooth. hilum elongate-ovate-oblong. 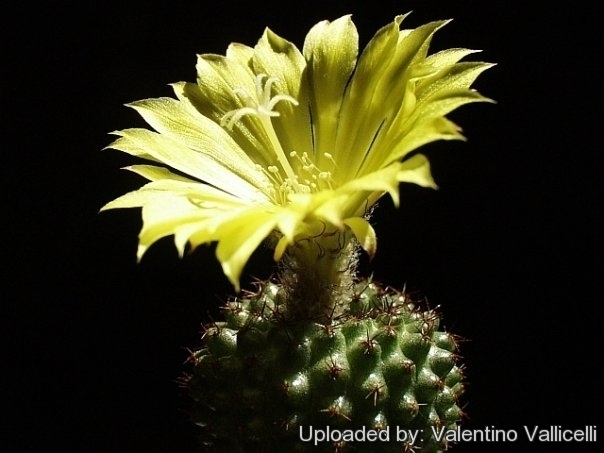 The seed is shaped strangely for a cactus , and is often described as “hat” or “boat” shaped with a prominent edge. 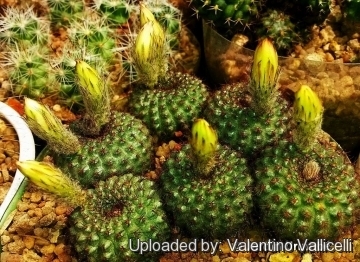 That is a good description, for it is among the few cactus seeds that float! They are thought to be dispersed in habitat by floating away on runoff. 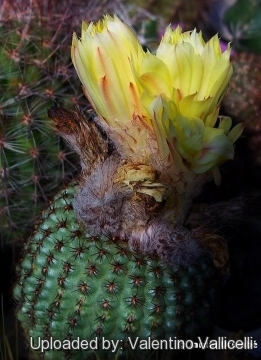 Frailea chiquitana Cárdenas: has green or purplish stems with dark purple-brown lunate, blots below the areoles. This species show no cleistogamous flowers. Distribution: Chiquitos and Cordillera province, department of Santa Cruz, Bolivia. 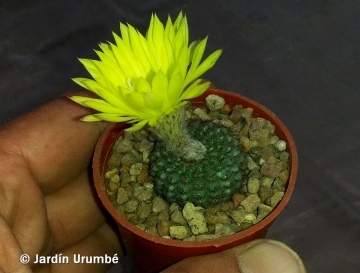 Frailea chiquitana f. cristata hort. : crested form. Garden origin. Frailea chiquitana Photo by: Andrea B.
Cultivation and Propagation: Frailea chiquitana is a summer grower species relatively easy to grow. It is sometime seen as a grafted plant but grows very well on its own roots too. Characteristically, during the dry season plants retract completely under the ground both in the wild and in cultivation too. Growth rate: Fraileas are relatively short-lived plants, only lasting few years (rarely more than 10-15 years in cultivation) and, possible annuals in habitat! In fact they reseed readily around the base of the mother plant if kept reasonably moist during warm weather. It is a good idea to keep restarting them from seed; what looks like a healthy big plant may suddenly die of old age without warning. Propagation: With fresh harvested seeds or (rarely) by grafting. Fraileas set seed (when well grown) and grow easily from seed. Seedlings dislike strong light and dry conditions and need to be repotted frequently during the first few years. However, old plants become senile and have a tendency to succumb to disease and a weak root system. At this stage, as is well known, they die suddenly. 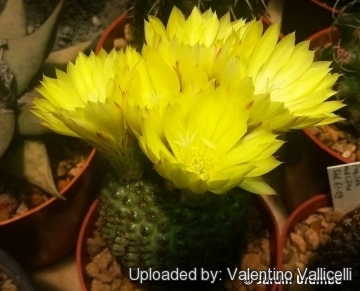 So, after they reach about 4-5 cm in diameter grow them slowly, and adopt a new repotting period, using intervals of every 3-4 years. Additionally grow them under drier conditions or with stronger sunlight. But plants are sometine grafted to accelerate growth, but the grafted plants are typical rather tall growing, compared with plants on their own roots that are usually more flat to the ground.